Next Post No broadband access…. Thanks a lot for your last improvements. How can I enable the special numbers option from a macro? Actually, I’m not sure if it’s indeed working from macro. If you could show me (either here or via email) a code snippet setting import options for csv document, I can take a look and see how it’s working. Thanks! where columns are separated by tabs, and cells may be padded by spaces. In the Calc sheet I want to get rid of the spaces and have the numbers as numbers. Ah, yes. I remember I modified the FilterOptions handling code. Basically, the new FilterOptions value has two boolean values appended to the end after Cell Format Codes for the four Columns (5), and one integer value between the Character Set (3) and the Number of First Line (4). 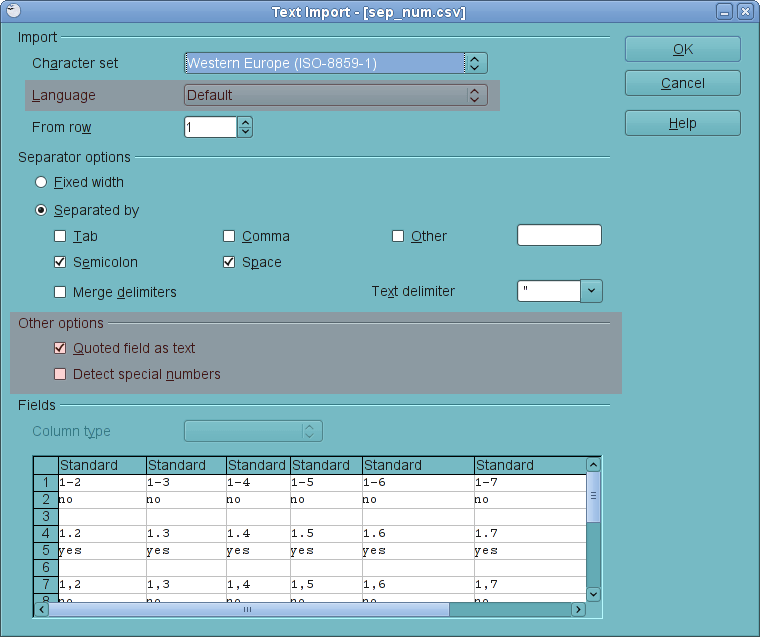 The new integer value is the language ID, while the two boolean values are for the “Quoted field as text” and “Detect special numbers” options in this order.